Several CR management system certification options are available for ensuring high CR performance of suppliers in the outsourcing industry, such as ISO 14001, SA8000, OHSAS 18001, and the Verego Social Responsibility Standard (Verego SRS). 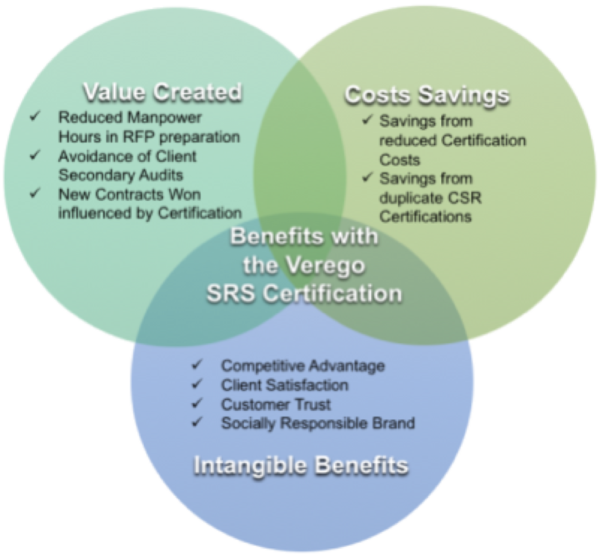 When looking across the CR certification landscape of options, Convergys ultimately chose the Verego SRS certification as it addressed the greatest range of environmental, social, and corporate governance issues within one standard, allowing the company to save roughly 70% on certification costs compared to acquiring multiple CR certifications to satisfy buyer sourcing requirements. As social responsibility initiatives and programs have become a standard part of the RFP preparation in the outsourcing industry, Convergys is able to utilize the Verego SRS Certification to reduce and even eliminate follow-up questions that require additional documentation for authentication during the RFP process. According to Convergys, RFP inquiries received by the company may include CSR sections that contain 1 or 2 topics governing environmental or social responsibility policies. Convergys is able to provide the Enterprise-Wide Verego SRS Certification Awards to potential clients showing compliance, not just in the CSR areas of environment and people, but also in leadership, ethics, and community. The Verego SRS Certification was able to identify opportunities for continuous improvement in the CR management systems of Convergys which overall fortified the organization’s sustainable competitive advantage. Most importantly, Convergys’s efforts to strengthen transparency and management of many CSR issues through the Verego SRS Certification, ultimately helped build customer trust and improve CR operational performance. 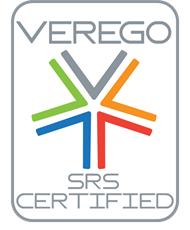 In 2014, arvato selected Verego to assess its structured approaches to Corporate Responsibility against the SRS Standard, and ultimately achieved Full Certification across their corporate enterprise in all 5 AREAs of the Verego SRS Standard (Leadership, Ethics, People, Community, and Environment). The Assessment Process validated existing structured approaches and also lead arvato to expand the Promotion of CR in their Supply Chain and establish a new conservation program to offset executive air travel emissions. arvato is a subsidiary of Bertelsmann AG, providing customer support and logistical services with more than 65,000 employees across 40 countries. They are one of the main Business Process Outsourcing (BPO) suppliers for many of the world’s leading telecoms, airlines, and technology companies, including Microsoft. For greater detail of arvato’s Certification Assessment, please click the button below to download a copy of their recently published Case Study.